In-depth Critique – Thursday, May 8, 6:30 p.m. Note: We encourage attending at least one open meeting before participating in an in-depth critique. Looking to get specific feedback on your writing from other writers? 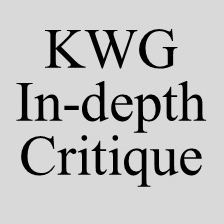 Consider participating in a KWG in-depth critique session. During each in-depth critique session, writers focus on what’s working in each submitted piece, and what questions each piece leaves the reader with. All submissions should be emailed to Chris DeGuire at darthdeguire@yahoo.com by midnight Sunday, May 4th. Next Post Open Meeting – Thursday, May 15 at 6:30 p.m.